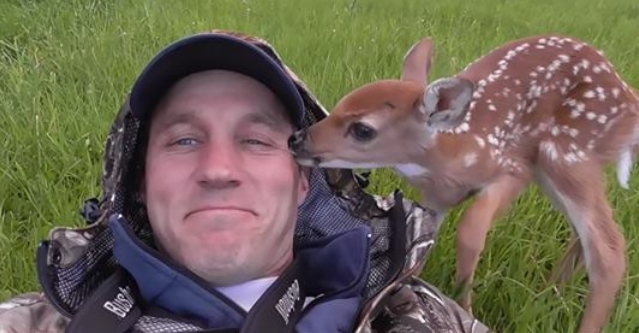 Baby deer rescue and release: The baby deer was healed and released back to her real mother. Lithuanian outdoorsman Darius Sasnauskas had a chance to witness a birth of two baby deer in his backyard near the Yellowstone National Park in the US. Unfortunately, one of them was injured and soon left behind by her family because she couldn’t keep up with them. After a lot of hard work, the baby deer was healthy again and it was time to set her free. However, the bond between her and Darius was so strong, that she kept coming back to him. Nevertheless, one very special evening she finally reunited with her family. Responses to "Baby Deer Doesn't Want To Leave The Man Who Saved Her Life "
His cat wanted to know WHY that animal was in her box? GOD IS GOOD. We are made in the likeness of the Creator.